NO BETTER SAWBLADE EXISTS - PERIOD! We spent months trying to find a blade that could perform well in steady cutting of our ultra-hard and ultra-tough DiamondWood Ipe decking. When we came up short we only had one option - develop our own blades. Our customers, be they contractors or handymen, are blown away by our Ipe Eater sawblades. They cut more cleanly, last longer between sharpening, and have massive ultra-hard teeth that can be sharpened over and over. Designed and built to handle the hardest wood on the planet, Ipe Eater's cut softer woods like a hot knife through butter. No matter what wood you're cutting or how demanding your project, you just won't find another blade that cuts cleaner for longer than our incredible Ipe Eater! Feel free to scroll down to the bottom of this page to see more technical details on why Ipe Eater's cut longer and cleaner per dollar than anything else on the market. This blade is terrific for portable battery-powered circular saws. It cuts quickly and very cleanly, offering an exceptionally long life and high performance compared to any other portable saw blades. Our most popular blade is perfect for general cutting with a handheld circular saw. It provides incredibly clean fast cuts in both cross-cutting and ripping applications. 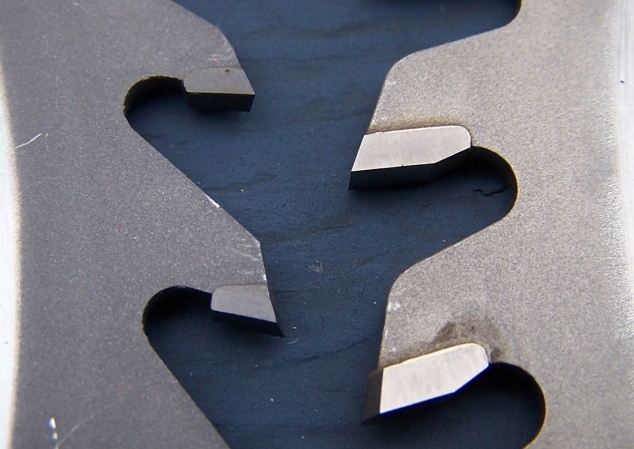 It will offer several times the cutting lifespan of any other 7 1/4" blade on the market. In addition to ipe, this blade easily cuts all hardoods, softwoods, plastic laminates, plywood/chipboard, arborite, formica and other plastic materials. This is an excellent mult-purpose blade. Its 60 teeth provide a good balance between cutting speed and smoothness. In addition to ipe, this blade easily cuts all hardoods, softwoods, plastic laminates, plywood/chipboard, arborite, formica and other plastic materials. This blade has 80 teeth for exceptionally clean cross cuts. In addition Ipe, it does an exceptional job cutting all hardwoods, softwoods, plastic laminates, plywood/chipwood, arborite, formica and other plastic materials. This blade is ideal for general cutting. Its 72 teeth provide a medium density tooth pattern which provides a good balance between cutting speed and smoothness. In additon to Ipe, this blade does an excellent job in all hardwoods, softwoods, plastic laminates, plywood/chipboard, arborite, formica and other plastic materials. This blade has a 96 tooth pattern which is ideal for producing very fine, beautifully smooth cuts. In addition to ipe, this blade easily cuts all hardoods, softwoods, plastic laminates, plywood/chipboard, arborite, formica and other plastic materials. An incredible amount of engineering went into the tooth design of these blades to ensure clean cuts - not just when freshly sharpened (any blade will do that), but also as the blade wears. Competitor's high-end blades rely on an alternate top bevel tooth pattern that concentrates all the cutting action on the tiny point at the top of each tooth. Bearing the brunt of the cutting load, this point dulls very quickly and, no longer sharp enough to pierce, must tear its way through the wood. Our "triple chip" tooth pattern is unique because, instead of relying on points to pierce, the blade uses edges to shave. This produces exceptional life because the cutting workload is shared by much more of the tooth's metal (an entire edge instead of just a single point). Also, the cutting style - shaving vs. piercing - is less dulling and less reliant on sharpness to produce a clean cut.